Emanuel Lasker is an interesting case. Some people put him first on the list, and others put him toward the bottom. The major criticism is that he played infrequently. The major argument in his favor is that he was world champion from 1894 until 1921 — longer than any other player in history. Many people believe that Lasker ducked the toughest opposition, but his tournament and match results clearly show that he was the world’s best player for a considerable period of time. Lasker established his credentials by winning four consecutive major tournaments (these tournaments were infrequent in those days): St. Petersburg 1895–96, Nuremberg 1896, London 1899, and Paris 1900. From 1895 to 1924, Lasker played in ten major tournaments, finished first eight times, second once, and third once. This achievement was clearly the best record of anyone during his time. 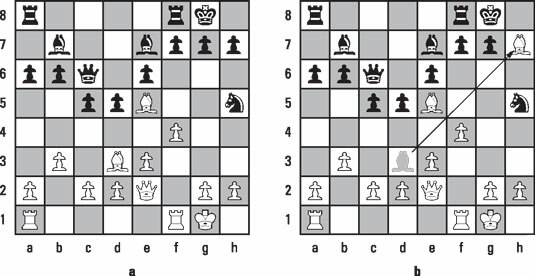 The following position occurs after the 14th move of the game Lasker versus Johann Bauer, which took place in 1889 in Amsterdam. The beginning of what was to become known as the classic two bishop sacrifice. Bauer almost certainly expected 15. Qxh5, when 15… . f5 would have made black’s position quite solid. We can only imagine what a surprise Lasker’s 15. Bxh7+ must have been. 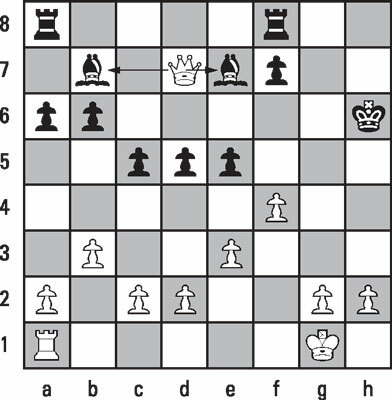 The second bishop sacrifice destroys black’s king cover. Garry Kasparov once wrote that today Lasker might try and copyright this idea! This maneuver is known as a “rook lift” because the rook is “lifted” in front of the g- and h-pawns. The threat is 20. Rh3#. This move is the sting at the end of the scorpion’s tail. One of black’s bishops must fall. The double attack on the black bishops means that one of them must fall. Black plays on, but the issue of who will win is no longer in doubt: 1-0 in 38 moves. Sacrifices such as the one in this game became part of the repertoire of every serious student of the game.